The Six Levels of Relationships: Where are Yours? There are six levels of professional relationships that you should be naturally moving your clients through. This is the starting point. We meet someone, have a brief conversation, and exchange business cards. We may stay in touch over the years, but there is little interaction. The individual is primarily just a name in our contact database. Acquaintances are contacts whom we have gotten to know a bit better, or friends we have carried with us through the different stages of our lives. We know something about each other, and may have actually spent a fair amount of time together; but the individual has never become a client. They may be important to us for other reasons, however; perhaps as source of friendship, information, and insight about markets and competitors, or as resources that we can introduce to our clients. At the beginning of your relationships with them, some contacts and acquaintances become clients for whom you are invariably hired in a narrow, expert role. The client has a problem she wants solved, and you have the specific knowledge and experience to deal with it. Almost all relationships begin in this way. At this stage, the trust and mutual understanding that enable a relationship to deepen simply have not developed yet. If you do a good job on the first engagement or transaction, you will probably be asked to supply more of your products and services. Don’t kid yourself, however—you’re still in “request-for-proposal territory,” just as you were when you were a solitary expert for hire. At this point, you may be spending a lot of your time with procurement managers or lower-level buyers, without the benefit of having an anchor into senior management. You are by no means part of this client’s inner circle; you’re more like a contractor who is managing many tradesmen or experts. You earn this coveted role—which was the subject of my first book, Clients For Life—by exemplifying a series of essential qualities that set you apart from the expert for hire or vendor. These include things like personal trustworthiness, independence, judgment, big-picture thinking, empathy, and others. You are now an agenda setter—someone who understands, is aligned with, and is helping to shape and improve your client’s agenda of critical priorities and goals. You’ll also experience great personal satisfaction in the role of a trusted counselor who is having a significant impact on client success. This is the ultimate goal, especially for a firm: to be a trusted advisor to your client and to harness the full power of your organization to address a variety of client issues. Finding yourself in this quadrant means that you have built a true partnership. You are helping to shape your client’s agenda, you’ve developed many-to-many relationships, and you are meeting an array of client needs with different services or products. It’s not an easy task to play this role with a client, but if you succeed, you and your firm will probably have a client for life—and a highly profitable one at that. Level 5 and Level 6 client relationships will contribute a disproportionately high percentage of your growth, revenue, profits, and intellectual capital development. They are where you will often have your greatest impact. Not every client will reach these levels. But when they do, your personal satisfaction—and not just your income statement—will dramatically grow. 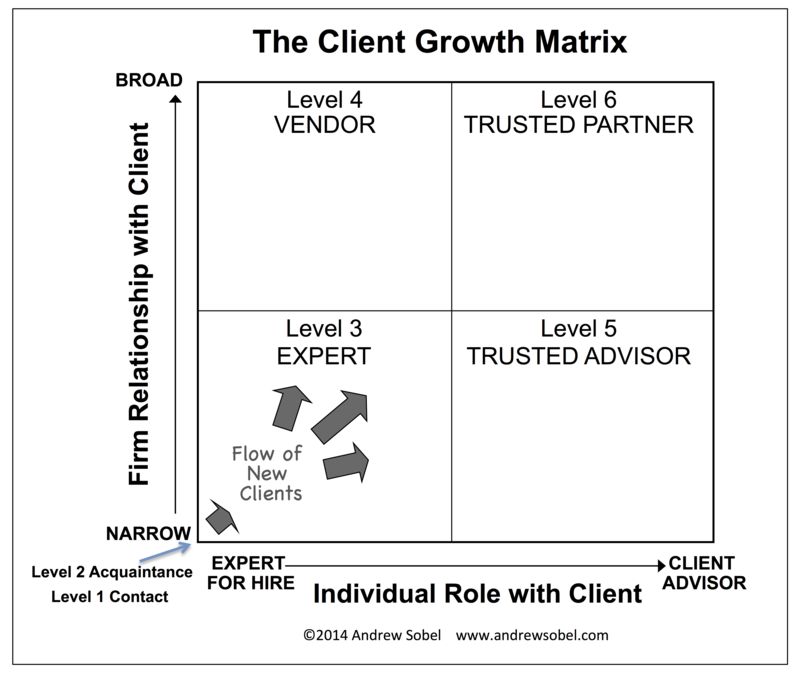 Where are your clients in the Client Growth Matrix? What strategies have helped you evolve your relationships through these stages?